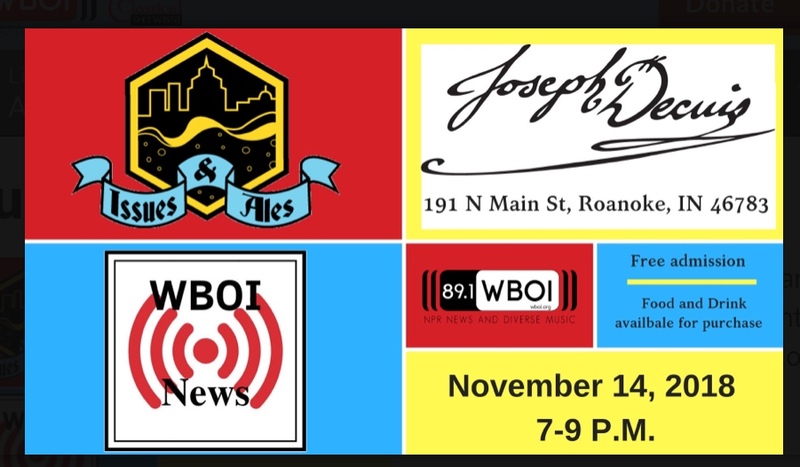 We are so excited to take part in WBOI's production of Issues & Ales. This is the first one for us! We hope you join us. Issues and Ales is a laid back panel discussion with the audience in a Q & A format. On November 14, the first topic will be discussing the midterm election results and at 8pm the topic will be healthcare access in rural communities in Indiana. We, along with WBOI, encourage you to come listen, take part. The food and drink is not mandatory - but is a nice addition to your evening. We will have our small plate menu available (all $18 and under) and special $5 drinks - beer, wines and featured cocktails. We hope you come in and enjoy your evening and learn a little something too.